This weekend Alex and I have been stripping wallpaper and sanding walls, it’s hard work, and so dusty! So for lunch today we needed something easy and nutritious, with minimal time spent in the kitchen. We’d picked up some spiralised vegetables cheap at the supermarket the other day, so we combined them with gluten free spaghetti, toasted cashew nuts, tarragon, and a cheaty sauce made from vegan cream cheese (we used violife brand). It was gorgeous, comforting while still giving us a good amount of vegetables, and some protein from the cashew nuts. The tarragon really makes it though! It’s a combination of flavours we’ll be making again, possibly with the vegetables diced rather than spiralised, the textures will work just as well. In a dry saucepan on a medium heat cook the cashews, stirring often until starting to brown, around 3 minutes. Tip into a dish to cool. Bring a large pan of salted water to the boil (use the cashew pan for ease), and cook the spaghetti according to the packet instructions. Steam the courgette and butternut squash (I use the microwave), 2 – 3 minutes each if spiralised, a little more if diced. Drain the pasta and return it to the pan on a low heat. Add the vegan cream cheese, tarragon and soy milk. Stir until the cream cheese has melted into a sauce. Mix in the nutritional yeast and salt and pepper to taste. Toss through the courgette, butternut and cashews. Sheesh that’s a long title, certainly for a lunch! I’ve been wanting to try the carrot and potato ‘cheese’ sauce that’s been doing the rounds on the internets for the last year or so. Normally when I’m craving that sort of sauce I just make a batch of my own recipe butternut squash sauce, but this one gets such rave reviews, I had to try it. 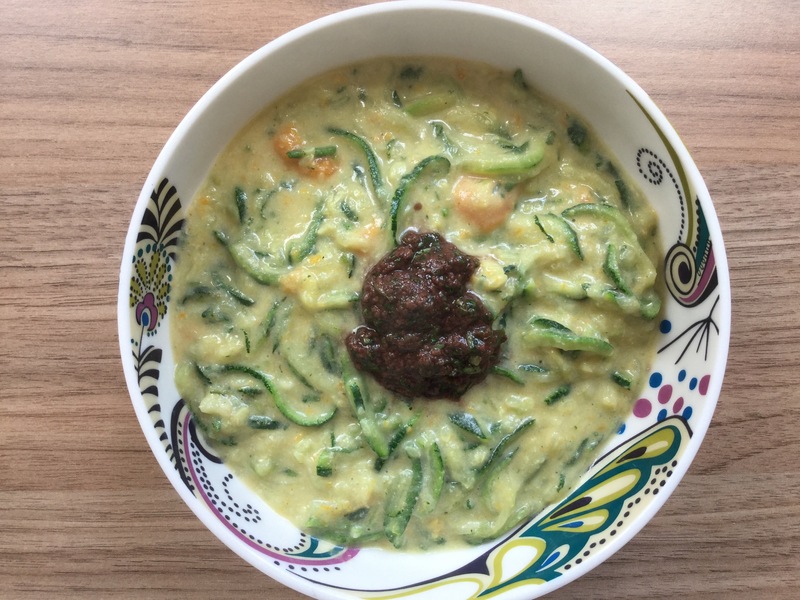 Having made a batch of it up, I then needed something to eat it with (to stop me from just standing over the pan with a spoon) I always enjoy making, and eating courgette spaghetti and the tapenade is just a lazy and healthier pesto equivalent.